Hey all, Duane here, aka DRFXTRADING, how’s it going? In this thread, I’m gonna be showing my Daily Video Analysis of the Currency Market using Candlestick Patterns/Price Action. 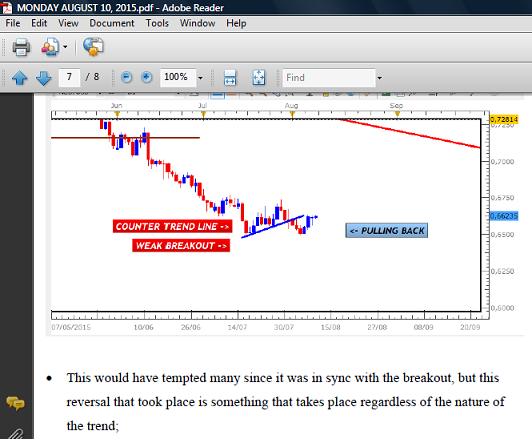 The focus is on the Daily and 4 Hour Charts where these patterns are clearer and offer larger Pips per trade. However, the patterns, rules and signals that are seen on these time frames are also seen on the Lower Charts and can be used for improved trading success for Day Traders as well. Each video looks firstly on the Daily and 4 Hour Charts where I try to identify any Swing Trading opportunities. I then move down to the 30 Minute Chart to see what is taking place during the day. I also take a look at the major any Economic Announcements and identify if any of them will impact the direction of the market. The pair had provided a strong Bull Candle Signal on its Daily Chart above the Range that was within a larger Pennant Consolidation. Although this was likely to lead to a rally, there was an important technical factor that led to a brief pullback which would have prevented the pair from an immediate bull move. If you were lucky to have avoided this pullback, you could start buying as it turns bullish once more. 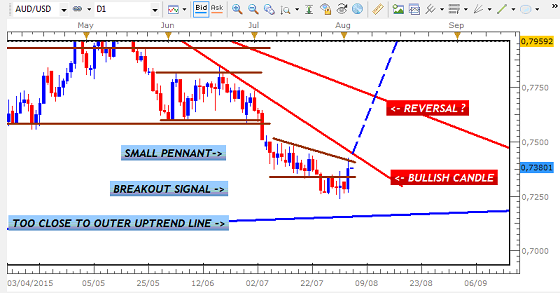 Between its current price of 121,52 and the Resistance, it could offer you 50 Pips. 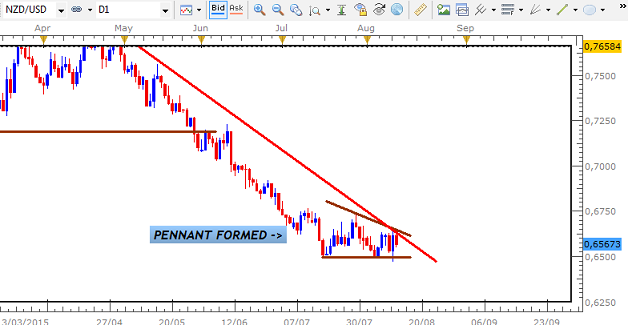 In this video, I show how the GBP looks to be heading back inside of the large Pennant Consolidation after 2 failed breakout attempts. Maybe 3rd time will be the charm, but all bets are likely gonna be placed on the bulls. However, there is a 3rd possibility for this pair between the Bullish and Bearish scenarios. 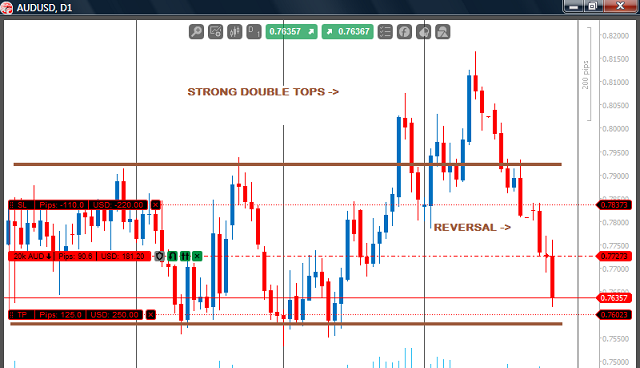 In this video, I showed how the sharp NZD CAD reversal took place as predicted. 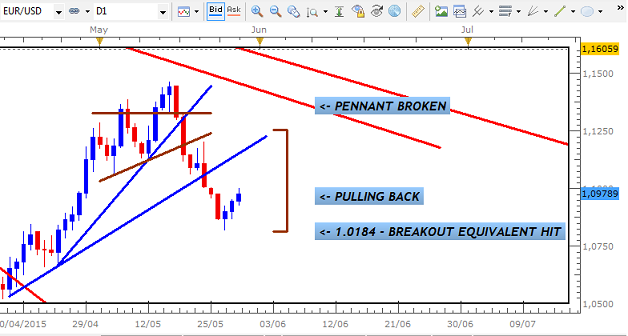 False Consolidation Breakouts are very common in the Currency Market, across all time frames. Once they are spotted, they can provide tremendous trading opportunities. A major aspect of these breakouts is when to enter and where to place your Stop Losses to be able to maximize on these sharp trends. I highlight one way in which this can be done using Trend Lines. EURO USD shaping as predicted for Day Trading opportunity today. 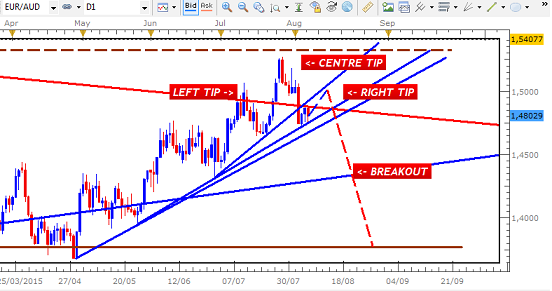 This could provide close to 90 Pips in gains if the market breaksout with a strong Bearish Candle below Support. If this takes place, it could lead to the stronger Daily Chart signal that Swing Traders require to enter short over the next few days. GBP USD beginning to look bearish. Possible ABC Signal being formed to break Uptrend Line. If this ABC Signal is formed, target would be the Downtrend Line that formed during the breakout from the Consolidation. If this bearish move doesnt take place, likely to see a sharp rally continue inside the Pennant- target would be at the 1,6900 area over the next few months. This False Breakout Setup and Signal that were seen a few days ago have now led to a strong Bearish reversal back inside of the Range Setup on the Daily Chart. Some traders would have entered short after seeing the Double Tops appear above Resistance. With entry at this area and a target set for the Support, they could be now be earning close to 300 Pips from this trade. For others who waited for the break inside of the Resistance for added confirmation, they could be up between 90 to 200 Pips. False Breakouts take place all the time with Consolidation, and the Double Tops/Bottoms are common signals that lead to these sharp moves. I had anticipated that a pullback was going to take place on this pair as it had reached the Breakout Equivalent of the Pennant. As can be seen in the graph below, this pullback has now started with a few bullish candles. This Breakout Equivalent is something you will see across the market. All Consolidations break towards these targets before either pulling back to start an opposing trend or pausing before resuming the current trend. In the case of the EURO USD, given the predominant downtrend, we are likely to see another bearish signal that signals continued gains for the USD in the weeks ahead. 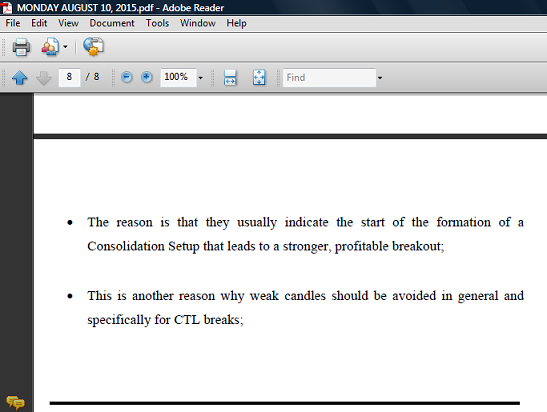 This Breakout Equivalent is a key aspect when it comes to trading Consolidation Breakouts. They are an excellent way of setting our targets ahead of pullbacks. We are very close to hitting the major Outer Uptrend Line on this pair, having broken out from several Consolidation Setups. However, whenever the market approaches these major barriers, we usually have a slowdown that makes trading at these areas very risky. As the market slows down - due to a build up of opposing Entry Orders, the market has a tendency to become erratic as it forms a setup to reverse before actually hitting the Trend Line. This has happened with the USD CAD and now looks set to take place on the AUD USD as well. As tempting as these trades can be - since we are 70-100 Pips away, which would be a good trade - avoiding trading here is the better decision. We are only a rally away from this pair completing the Pennant Setup on its Daily Chart. As you will see in the graph in the video below, a strong Bullish Break above the Downtrend Line will indicate that we are headed to Resistance. This would complete the Support Boundary as well. If the Signal is strong enough and is supported by a good setup on the 4 Hour Chart, I will consider trading it according to my Methodology. 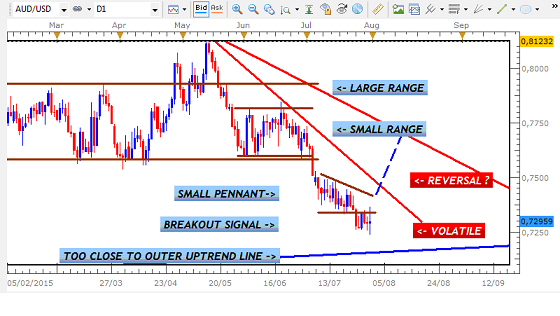 Given the distance to Resistance, between 150- 200 Pips will be on offer. Hey all, how´s the trading going? 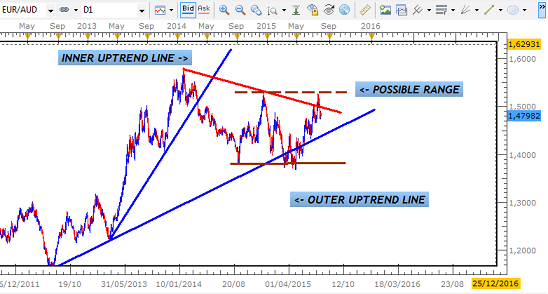 As was predicted yesterday, the AUD USD has started to pullback after being volatile above the Outer Uptrend Line. 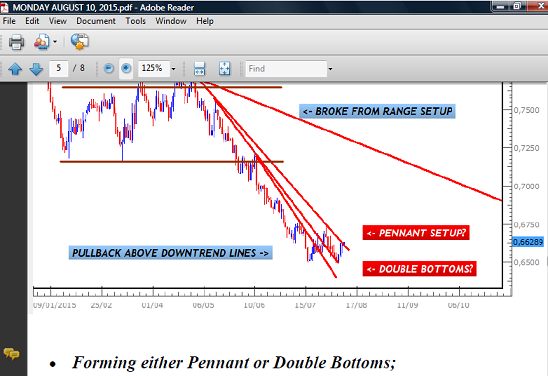 Rally, forming a Setup that leads to a stronger Breakout above the Downtrend Lines. Move sideways to form a stronger Consolidation before breaking the Outer Trend Line. Hello all, how´s the trading? Apart from some brief volatility related to the USD NFP this morning, the Euro didnt really move much today against the AUD. Right now it appears that a Range Setup could be taking shape on the Daily Chart, with a Bearish Wave left to complete the Range. Having broken through several Downtrend Lines with a sharp rally, this pair has now finally taken a breather below the last major Downtrend Line. Right now it is too close to this Trend Line to justify a trade, because as we now see with the AUD USD above, things tend to become erratic when we`re this close to these major boundaries. So with that risk in mind, the better option seems to be to wait it out until we get a break bearish to resume the major Downtrend. Trading within this boundary can be done BUT!! whenever these Consolidations are this small, they usually are difficult to trade. The safer option is always to wait for a clear breakout. We are now seeing a Range Setup below this line at the Inner Downtrend Line and just below the Outer Downtrend Line. Given the greater bias to the downside, this Range should give way to a break of its Support boundary over the next few days to carry us to that Outer Uptrend Line. However, what you will find is that even though most breaks from the Inner Trend Line tend to go to the Outer Trend Line, once this major trend is still in place, it could also U-Turn to resume this trend without hitting the Outer Trend Line. Nevertheless, given the strong Bear Crown Setup that led to this new Downtrend, the more likely scenario seems to be a continued move towards the Outer Uptrend Line. 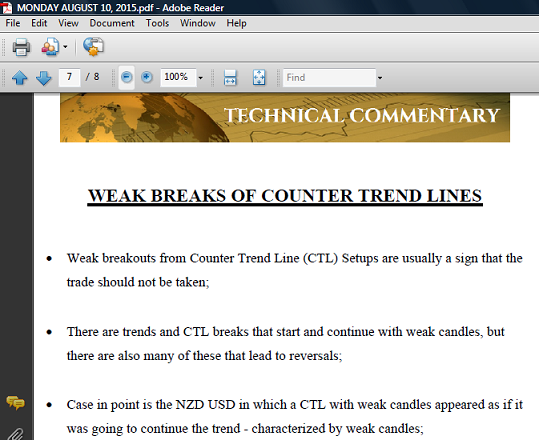 The analysis is good, but too many trendlines being marked at different time frames. Initially it is confusing but when we co-relate with the actual market movement the analysis is fruitful. Ok, less trend lines would make it easier? Well based on how I use Price Action, it requires these Trend Lines in order to explain important movements such as breaks that take us from one Trend Line to another etc. and to show those who use them how to draw them. However, if some of these are not necessary in explaining whats happening then I can adjust. I understand that zooming in and out of the trendline according to the different timeframe analysis is essential, just that a little bit of too much for newbie or amateur trader. Is there any way that we can just use the trendline at the larger time frame and keep the same as reference for trading, just my query. Thanks. VERY educational. You do a great job of explaining the all the possible scenarios to keep an eye out for. Please continue to keep this thread active as I feel it may be one of the highest quality educational threads on this board. If I may ask, what do you think about the pennant that appears to be forming above .6500 on the NZD/USD pair? The problem is that when I zoom in, there are additional Trend Lines that are formed that may not be visible when I zoom out. So just using the trend lines from the wider view may lead you to miss important things taking place such as Trend Line breaks on a closer view. As you get used to them, it will become easier. Hey PoPip thanks for the good words. How is your trading going and what strategy do you use? 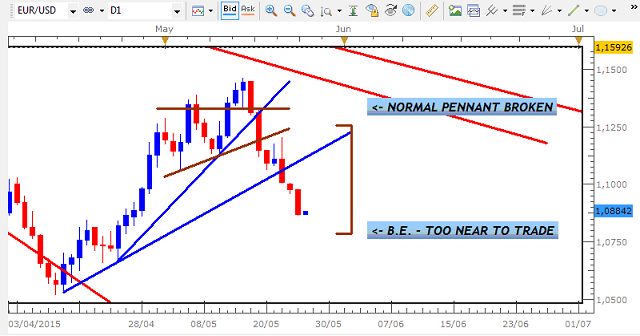 …one of the “tricks” or dynamics of the Forex that can lead to losses.